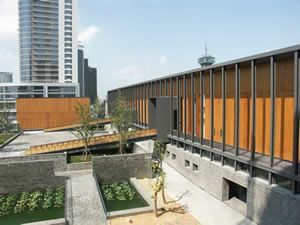 Ningbo Museum of Art works directly with the Ningbo Federation of Literary and Art Circles. Powered by their expertise and dedication, the Museum not only emphasizes the promotion of local artists, but also on worldwide artistic trends. With bilateral exchange programs and academic symposiums and exhibitions, the Museum aims to increase its international appeal. The Museum is located in the Bund area , by the river Yong. This site is the birthplace of early marine transportation and trade business in Ningbo. Converted and rebuilt from a port control building, the Museum construction retains the control tower, which along with the unique architectural form of dual-shell square base symbolizes an "Ark of Art" parked by the river. The Museum consists of the main building, 2 piers and a rooftop plaza. The main building possesses one comprehensive exhibition hall, two primary halls and five secondary exhibition rooms with a total exhibition space of 5,300 square meters. There are also 3 separate collection vaults and additional auxiliary facilities, including a 400-seat conference hall, artist saloon, artist studio, and education center.